It’s Mother’s Day! And just like the last 5 years, I’m not with my mom to celebrate. I don’t get to give her a big hug and make her breakfast in bed like she deserves. I selfishly chose to start my adult life 6000 miles away. Me and my mom always had a special bond. I never got to that age where I was embarressed of giving my mom a hug in front of other kids or any of those stupid things kids get embarressed off. I never had many fights with my mom as a teenager, she was always the one I could turn to. When Anything fun or dramatic would happen at school, I would ride my bike home as fast as I could to tell my mom about it. When me and my sister were in elementary she and my dad wanted her to stay home so that we’d never be alone or be “key kids.” As they call it in holland. That means that at a young age you have the key to your house and you’re just home alone until your parents get home from work. We were lucky that my dad made enough money by himself that my parents were able to work things out that way, since nowadays for many families that’s impossible. When my mom and dad had a rough patch in their marriage, she could’ve easily given up, and left. She would’ve had the world on her side and nobody would blame her. But she chose the harder route. My parents worked out their issues. My mom is loyal, and when my parents got married they made a commitment to each other for life. My mom has taught me so much about forgiveness and to look at the most important things in life. While I had posters of movie stars in my room, I should’ve just looked at my mom, she is the only role model I needed. My mom was our everything growing up, our teacher, our coach, our alarm clock, our detective, our caretaker and our best friend. Thank you mom, for having made me the person I’m proud to be today. I’m going in December for Christmas and New years. We celebrate Christmas, like y’all do over here in the states, but instead of having Christmas eve, we have 2 whole Christmas days. I guess that helps couples split the holidays up to visit both families each days, instead of having to choose only one side. You’re probably thinking, I would never make 2 long trips like that within 2 days… Well I’ve noticed that here, most people’s families live hours away from each other, sometimes in different states.. In Holland, it doesn’t matter where your family lives, you can always get there in a short time, since you can drive through the whole country in just 3 hours. This thing stands in the middle of the table surrounded by raw meats, eggs and veggies. 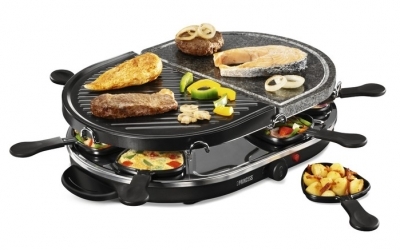 It makes things really easy, because everyone puts their choice of meat on the little grill. Your basically your own cook. On the second Christmas day, in my family our tradition has been to eat at my aunt and uncles house. We eat there with the whole family at one huge table. Since my cousin is a chef at a really nice restaurant in Holland, she usually does the cooking. It always tastes incredible. She splits the meals up in little courses, so we’ll all sit at the table for a few hours just drinking wine and catching up. We also have a different kind of Christmas, which is celebrated on December the 5th. 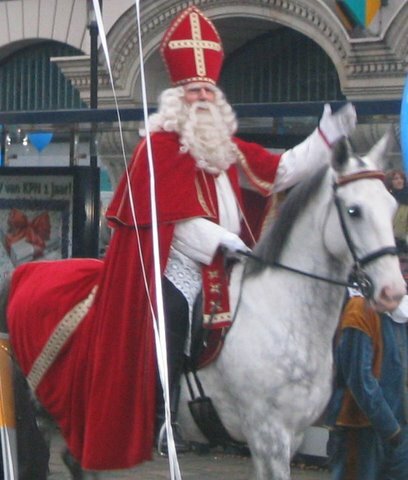 Its called “Sinterklaas.” Its an old man with a white beard too, but he doesn’t have a slee or reindeer… he rides a white horse. The story is that he walks on the roofs at night and his helpers (he needs helpers cause he is old) go down the chimney and place the presents in the childrens shoes. The night before, the children will put one shoe in front of the fireplace and sing songs together. 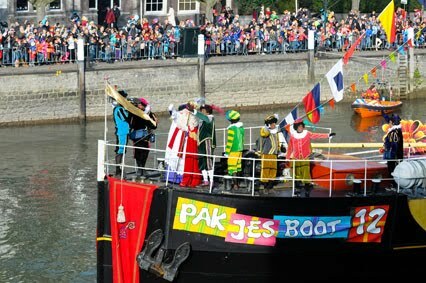 There has been a lot of controversy from the black people that live in Holland, that our traditional Sinterklaas is racist, because his helpers are black. To me this is a bunch of bull, because the helpers aren’t really the colored race, the helpers are black because they have gone through the chimney so many times.